ISTANBUL --- The Pakistan Navy Fleet Tanker (PNFT), one of the biggest single-item export projects of the Turkish defense industry, was delivered to the Pakistan Navy at a commissioning ceremony held in Karachi yesterday. Pakistani President Arif Alvi, Defense Industries President İsmail Demir, Deputy Minister of National Defense Muhsin Dere, Defense Technologies Engineering and Trade Inc. (STM) Chairman İhsan Kaya, STM General Manager Murat İkinci, STM Karachi Director Halil Baş and the military authorities of the two countries participated in the Navy Fleet Tanker's delivery ceremony held at Pakistan's Navy Shipyard in Karachi. Defense Industry Chairman Demir said in a statement to reporters after the ceremony that with the ship, Turkey's engineering accumulation was exported to the brother country. The ship was constructed in Karachi, but it reached this point with Turkey's engineering support, strength and design, Demir stressed. In response to the question regarding the recent success of Turkish companies against strong rivals in defense industry projects in Pakistan, Demir said: "Western systems dominate here like in most countries. We needed to surpass them. We had to demonstrate that we could surpass them with a technical qualification. Although we often had the cost advantage, we had to demonstrate ourselves in technical superiority as well. This is crucial and has been done by surpassing marketing structures that have been formed for years." Pointing out that China, which was very active in the region, was another rival, Demir said that their proposals were attractive in terms of financing and price. "They work in many areas in Pakistan, but this is a competition," he noted. With a maximum speed of 20 nautical miles, the 158-meter PNFT is 22 meters in width and can handle up to 15,600 tons in tonnage. PNFT can also perform day and night helicopter operations. Meanwhile, the Pakistan Navy named the ship "PNS MOAWIN." In July this year, Ankara also won a multibillion-dollar tender to supply four corvettes to the Pakistan Navy - a deal dubbed the highest export deal in the history of Turkey's defense industry by then-Defense Minister Nurettin Canikli. According to the agreement, two ships will be built in Istanbul, while two others in Karachi. The first pair of the corvettes will join the inventory of Pakistan's naval forces in 2023, while the remaining two will be handed over in 2024. Touching on the latest situation in the export of MİLGEM corvettes and ATAK helicopters to Pakistan, Demir stated: "Our friends are making the final determinations about MİLGEM. Two of the ships will be built here, and the two will be built in Turkey. Engineering work on how the construction here will be and how drawing will be made needs to start. Our Defense Ministry and we are here to set a common road map and start and finalize the project in a way that it will honor Turkey." According to Demir, the ATAK Project has been signed and an export permit process is in progress. In addition, small-scale sales and cooperation talks are underway on various electronic warfare systems, ammunition, and light and heavy weapons, which have not been declared to the public. 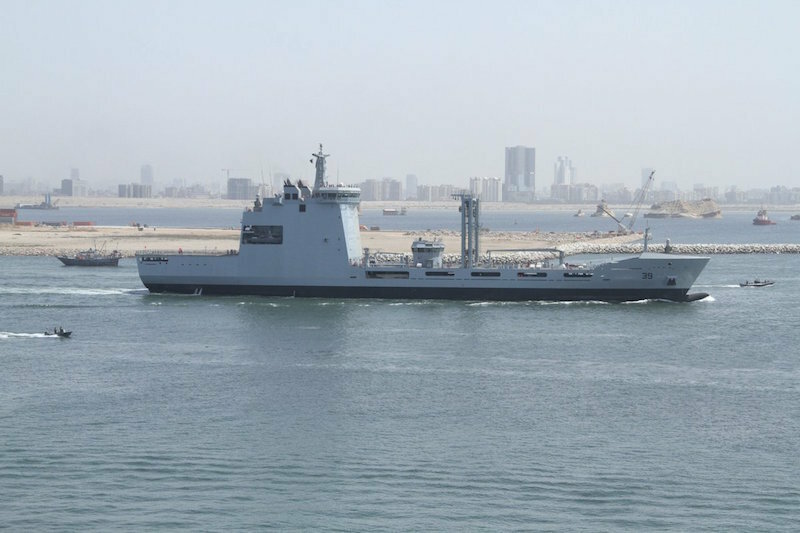 The Fleet Tanker designed through domestic means by STM, subsidiary of SSB, was delivered to Pakistan Navy. Providing the possibility of export for more than 20 Turkish companies, the vessel is the pride of the Presidency as it is the first of its class. KARACHI --- A 17,000-ton Fleet Tanker named PNS MOAWIN was commissioned during an impressive ceremony held at Pakistan Navy Dockyard, Karachi. President of Pakistan, Dr Arif Alvi graced the occasion as Chief Guest. Chief of the Naval Staff, Admiral Zafar Mahmood Abbasi was also present on the occasion. PNS MOAWIN is the largest warship ever constructed in Karachi Shipyard & Engineering Works, in collaboration with Savunma Teknologiler Muhendisilik (STM) of Turkey. The ship is capable of performing variety of maritime operations including provision of logistic support to other ships at sea through transfer of fuel and other important military cargo. It can carry two helicopters. The ship is also equipped with state-of-the-art medical facilities and can provide overseas support to friendly countries during any Humanitarian Assistance and Disaster Relief. During his welcome address, Chief of the Naval Staff Admiral Zafar Mahmood Abbasi highlighted that Pakistan Navy has been striving to achieve self-reliance in warship construction. Construction of various Naval platforms like F-22-P Frigates, submarines and Combat Support Ships in Pakistan in past and various warships and submarine construction projects planned in future will substantially enhance our ship building capability. While addressing the ceremony, the President said that Pakistan is blessed with immense maritime resources which can be optimally exploited through development of our maritime sector or the Blue Economy. The development of this sector will enhance our exports, generate employment and increase foreign exchange, he added. He said that with the realization of CPEC, the maritime trade and activity off our coast will increase manifold which calls for a strong Navy to provide security and seaward defence. He said that government will provide all necessary resources to enhance the capability of Pakistan Navy and help develop our maritime sector. The chief guest further said that Pakistan and Turkey have time tested and deep-rooted relationship and joint ventures like PNS MOAWIN will further strengthen these relations and open new vistas of cooperation. The President also congratulated Ministry of Defence Production, Pakistan Navy, M/s STM of Turkey and Karachi Shipyard for constructing this 17,000-ton ship in Pakistan. Besides Federal Ministers, diplomatic community, notable civilian and military officials, the ceremony was also attended by Turkish officials including Mr Ismael Demir, President Turkish Defence Industries, Mr Muhsin Dere, Deputy Minister of Defence and other key Turkish officials.